The conflict between economic growth and environmental protection is becoming more apparent as the oversized economy bumps up against limits. From depletion of ocean fisheries to loss of pollinators, from groundwater drawdown to deforestation, from climate change to increasing concentrations of toxic pollution (not to mention increasing childhood cancer rates), from massive urban slums to degraded rural lands, the consequences of too much economic growth are observable all around us. Ecological footprint analysis also reveals that the economy has become overgrown. The footprint measures how much land and water area a human population requires to produce the resources it consumes and to absorb its wastes under prevailing technology. According to data from the Global Footprint Network, the footprint of all nations exceeded the biological capacity of the planet in the mid- to late 1980s. We find ourselves in a global state of overshoot, accumulating ecological debt by depleting natural capital to keep the economy growing. * futureless growth, where the present generation squanders resources needed by future generations. The downsides of economic growth can be avoided by maintaining an optimal scale of the economy. Marginal cost refers to the cost of producing one more unit of a good or service. Marginal benefit is the benefit gained from one more unit. 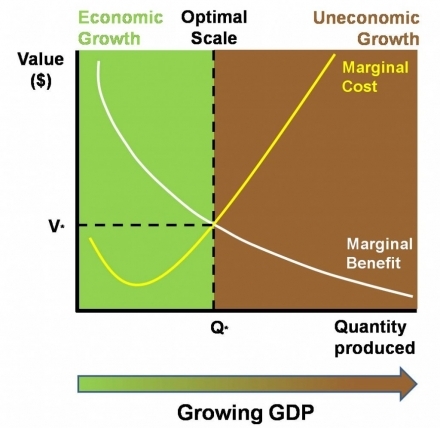 This graph shows the marginal costs and benefits of GDP growth. Costs tend to rise and benefits tend to decrease for each additional unit of growth. We should stop growing GDP, therefore, when marginal costs are exactly equal to marginal benefits. If costs are less than benefits, then GDP growth is economic (the green part of the graph). When costs rise above benefits, GDP growth is uneconomic (the brown part). * studying the means to establish a steady state economy. This entry was posted on Monday, August 15th, 2011 at 3:00 pm	and is filed under The Union List. You can follow any responses to this entry through the RSS 2.0 feed. You can skip to the end and leave a response. Pinging is currently not allowed.